Today, August 29, 2013, the United States Mint released the collector 2013-P America the Beautiful Five Ounce Silver Uncirculated Coin commemorating Fort McHenry National Monument and Historic Shrine in Maryland. It is the fourth uncirculated coin this year from the America the Beautiful series with earlier 2013 coins honoring White Mountain National Forest in New Hampshire, Perry’s Victory & International Peace Memorial in Ohio, and Great Basin National Park in Nevada. These coins for collectors are struck from 99.9% pure silver to a weight of 5.0 troy ounces, a diameter of 3.0 inches, and a thickness of 0.165 inches. Many collectors held their breath for this release, hoping its price wouldn’t go up before launching. It didn’t. The coin can be picked up for $154.95, the same start (and current) price of the last five ounce coin depicting Great Basin National Park. There’s a big difference between then and now. The London Fix for silver was $19.92 an ounce when the Great Basin coin debuted on July 25, which placed its price at $11.07 per ounce over spot. Today’s silver fixing was $24.11 an ounce, making for an even lower launch price of $6.88 per ounce over spot — almost the premium level for the bullion coins. Customers can enjoy a bit more savings by placing orders online. The U.S. Mint is running a free standard shipping promotion through September 30. Expedited shipping is also lower by $4.95. 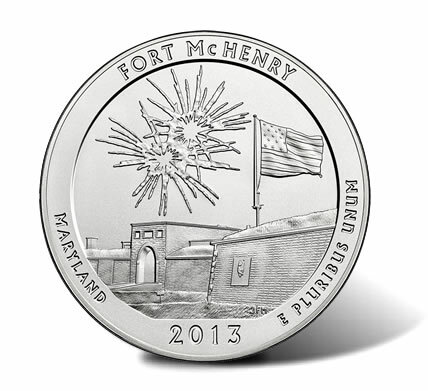 Designs on the uncirculated coin are the same as those on Fort McHenry quarters which debuted on Monday, August 26, 2013. Reverses or tails side show a scene of "Defenders Day" with fireworks above Fort McHenry to symbolize the "rocket’s red glare," a reminder about the fort’s historic past when Francis Scott Key wrote the poem "Defence of Fort McHenry" during the War of 1812. The poem was later set to music and became the national anthem of the U.S. as, "The Star Spangled Banner." Inscriptions around the scene on the coin read FORT McHENRY, MARYLAND, 2013 and E PLURIBUS UNUM. 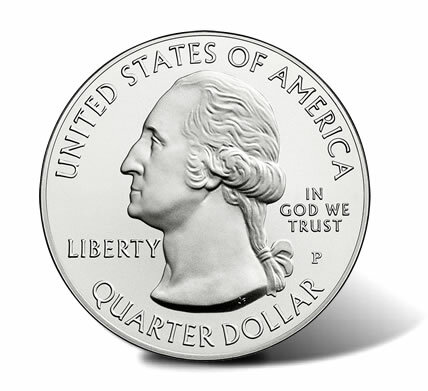 John Flanagan’s portrait of George Washington appears on the obverse or heads side with inscriptions stating, "UNITED STATES OF AMERICA," "QUARTER DOLLAR," "LIBERTY," and "IN GOD WE TRUST." Produced at the Philadelphia Mint, a "P" mint mark is found to the right. Incused on the edge of the coins are ".999 FINE SILVER 5.0 OUNCE." 2013-P Fort McHenry Five Ounce Silver Uncirculated Coins may be ordered from the U.S. Mint either from its website, right here, or by phone at 1-800-USA-MINT (872-6468). Only web orders will receive free standard shipping or discounted expedited shipping. There are no household ordering limits, though the silver coin’s mintage maximum is set at 25,000. Coins arrive encapsulated, set inside a protective outer box and come with a U.S. Mint Certificate of Authenticity. In addition to this collectible Fort McHenry Five Ounce Silver Uncirculated Coin, the United States Mint sells a bullion version intended for investors. It launched on August 26, 2013 with sales now at 10,200. The U.S. Mint does not sell bullion coins directly to the public. Authorized distributors buy them from the Mint and they eventually make their way into the consumer market for several dollars per ounce over spot. Unlike the collector coins, bullion versions have a brilliant finish, lack the "P" mint mark and do not come in special U.S. Mint packaging with a Certificate of Authenticity. 18,462 for the 2013-P White Mountain National Forest 5 Ounce Silver Uncirculated Coin released on May 16. 14,194 for the 2013-P Perry’s Victory and International Peace Memorial 5 Ounce Silver Uncirculated Coin released on June 6. 13,627 for the 2013-P Great Basin National Park 5 Ounce Silver Uncirculated Coin released on July 25. An early November release is scheduled for the final issue of this year which commemorates Mount Rushmore National Memorial in South Dakota. They need to drop the mintage down to 15,000. Make it valuable. With free shipping from the mint and low silver prices the Fort McHenry 5 oz’r won’t be the lowest produced unless the mint pulls a fast one like it did with the Hawaiian coin. JimmyD Make sure you get free shipping. My last 3 orders I was charged shipping and had to call the mint to get a refund on the shipping.